Free Shipping Included! 50ft Black String Lights, 60 G40 Globe Bulbs (10 Extra): Connectable, Waterproof, Indoor/Outdoor Globe String Lights for Patios, Parties, Weddings, Backyards, Porches, Gazebos, Pergolas & More by Outdoor Lighting Store at Two Clock. MPN: 5823668850. Hurry! Limited time offer. Offer valid only while supplies last. The Easiest Way To Create The Perfect Atmosphere You won't believe how much your indoor or outdoor space will change with these patio string lights. You won't believe how much your indoor or outdoor space will change with these patio string lights. A warm and cozy ambiance, beautifully and discreetly lit, the ideal scenery for you to relax after a long day, have a glass of wine and something to eat in the company of loved ones. An opportunity to make your garden, patio, backyard or living room a place you long to spend time in. Instantly add a romantic touch to your wedding reception and imagine how beautiful your photos will look with these low voltage string lights charmingly lighting the background. Organize your birthday, anniversary, pool, garden or any possible kind of party, without thinking about detailed and excessive decorations - your outdoor party lights are all you need to create the perfect atmosphere for any event. Each set of plug in string lights comes securely packaged ensuring it arrives intact. In the box, you'll find 1 50ft black cable and 60 clear G40 bulbs carefully packed in styrofoam to protect them in transit. 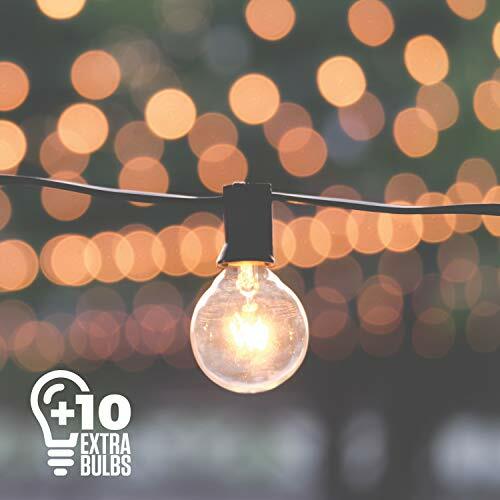 In case you experience some small accidents, we include 10 extra bulbs so that you can use your set of 50 fully lit light bulbs to decorate your space without any annoying losses or hold ups. Lead Length (both ends): 6"
We strive to make every customer experience 5 stars, which is why we offer a 100% satisfaction guarantee. If for any reason you are not happy with your bulb string lights or service you received, contact us and we will happily work with you to resolve any issue to your satisfaction. If you have any questions about this product by Outdoor Lighting Store, contact us by completing and submitting the form below. If you are looking for a specif part number, please include it with your message.